The population structure and regeneration status of Magnolia punduana Hk. 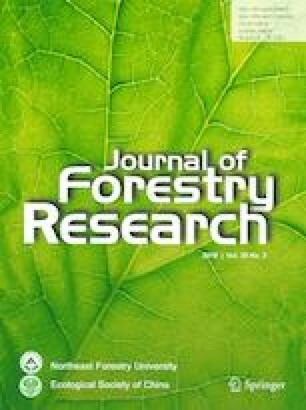 f. & Th., an endemic tree species of northeast India were investigated in fragmented forests in the Jarain Hills and in adjoining areas of Meghalaya state. The population structure was discontinuous in all the fragments with the absence of individuals in higher diameter classes. The number of individuals increased with the size of the fragment patches (p < 0.004). The density of mature trees (≥ 5 cm dbh) was high (24–30 individuals ha−1) in the largest fragment (> 105 ha). The number of seedlings and saplings were also higher in the larger fragments. Human-related disturbances had a negative impact on the species population (p < 0.002). Variation in the population density in different forest patches has been attributed to fragment size, site characteristics and ongoing human disturbances. The restricted distribution of the species coupled with exploitation and habitat destruction underlines the need for its conservation. Project funding: This study is supported by the University Grants Commission (UGC) (Grant no. : F1-17.1/2013-14/RGNF-2013-14-ST-NAG-43868/(SA-III/website) and (Grant no. F.15-6 (Dec., 2011)/2012 (NET)). We thank the Buam Raid of Thungbulli village, Headman of Jarain, Umladkur and Amlarem villages and the CEO of Jaintia Hills Autonomous District Council for allowing us to work in the area.